Shazam! reportedly has a Superman cameo from an actor that is not Henry Cavill. It has been rumored ever since David Sandberg's movie was announced that the Man of Steel was going to have a cameo. 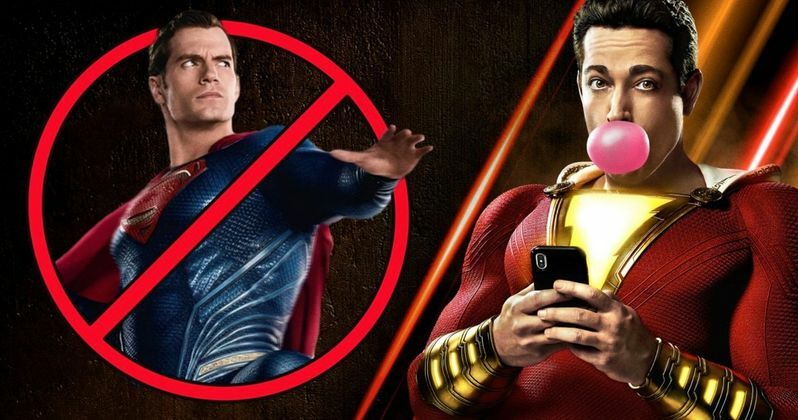 However, those discussions were struck down last year over reports that Cavill and the studio could not reach an agreement over Man of Steel 2 and an appearance in the upcoming Shazam! movie. But, it looks like the studio may have found a way around using Cavill. There could possibly be SPOILERS for Shazam! below, so read ahead at your own risk. According to sources close to the Shazam! production, Superman does appear in the movie at the very end. Apparently the cameo is the payoff to a running joke throughout the movie. The joke revolves around Billy Batson's foster brother, Freddy Freeman, who has been asking him to show up at his school in the Shazam suit to prove to his friends and classmates that he really knows the superhero. At the end of the movie, Batson agrees, and brings along a friend. After Billy Batson shows up at Freddy Freeman's school, he introduces Superman, but we don't see Henry Cavill. Instead, we reportedly never see his face and a body double was used on the set. Obviously, this news comes from sources who claim to be close to the Shazam! production, which makes this a rumor for the time being. However, if this ends up being true, it could cause quite a stir amongst DCEU fans from all over the world, angry that the studio made the decision to use someone other than Cavill as Superman. You never know, there's still a little bit of time before Shazam! hits theaters. This could have been a decoy scene to keep a real Henry Cavill cameo a secret. It's entirely possible that David Sandberg could have had a private day with Cavill with a skeleton crew who all had to sign NDAs. Stranger things have happened, but for now this is speculation. Shazam! doesn't hit theaters until April 5th, so we have a little while to find out, unless early screenings spoil anything. We Got This Covered was the first to announce a Superman cameo in Shazam! without Henry Cavill's involvement.